Emory experts are examining climate change from a variety of disciplines. Here is a sample of just a few of the research efforts currently underway. 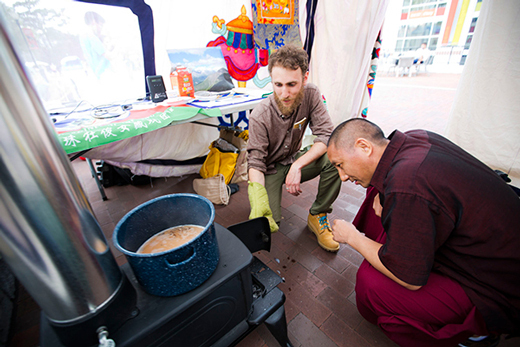 Steve Sclar traveled to Golog Tibetan Autonomous Prefecture in China last summer to research the indoor air quality of nomads, who burn yak dung in their stoves for warmth and to cook their food. His measurements showed high levels of fine particulate matter in the smoked-filled tents and homes of some of the nomads. But Sclar also caught a glimpse of how global pollutants from industrialization may be impacting the isolated realm of the Tibetan plateau. "The Tibetans are noticing changes in their climate and they're worried about the effects," says Sclar, an MPH student in Rollins School of Public Health's Department of Environmental Health. "Their grassland is getting poorer in the summer months and they see the snow pack getting smaller on the holiest mountain range in the region, known as Amnye Machen. "I asked one nomad, 'What happens if Amnye Machen loses all of its snow?' He told me, 'Then it's the end of the world.'" Climate change "is the biggest environmental health problem we face," Sclar says, "and yet it is so hard to pin down. There's no one country or entity to blame, and there is no one field of study that has the solution. We need to figure out how to reconcile all this." Climate@Emory is an initiative made up of more than 50 faculty and staff from 20 departments across the university. Its goal is to harness Emory's strengths to help it play a leading role in the global response to perhaps the most complicated and pressing problem of our time. Since its launch last fall, the initiative has worked to support, connect and expand Emory's climate-related scholarship, teaching and community engagement. "It's really not possible to understand climate change from the standpoint of any one discipline," says Eri Saikawa, who is Sclar's adviser and one of the founders of Climate@Emory. She is an assistant professor at Rollins and in the Department of Environmental Sciences. "We want to connect the dots to improve the quality and impact of Emory's research and provide a platform for intellectual engagement on climate change." Climate@Emory recently launched a website that highlights the climate-related expertise of Emory's faculty across a range of disciplines and provides guidance for students on climate-related course offerings and other learning opportunities. The website also gives details about relevant events on campus, including the ongoing Climate@Emory Seminar Series. The group is also launching the first annual "Climate@Emory Day of Scholarship" on Friday, April 24. The event, from 8:30 a.m. to 5 p.m. in White Hall, room 208, will feature poster sessions of ongoing climate-related research by students. The day will also include speakers from Georgia Tech and Emory across an array of disciplines, from paleoclimate, environmental health and policy, to bioethics and religious thought. "The Day of Scholarship aims to initiate multi-disciplinary collaborations on the Emory campus, as well as between other universities throughout the greater Atlanta area," Saikawa says. From the smoke of open stoves in the developing parts of the world, to the pollution of coal-fired utilities and gas-guzzling SUVs in industrialized countries, the issues of climate change are tightly bound up with culture, politics, religion and economics, says Saikawa, who is an expert in atmospheric chemistry and environmental policy. Her classes on air pollution and ecological economics draw students from majors throughout the sciences and humanities. A public health powerhouse, Emory is also a major player in medicine, business, ethics, religion, law, the humanities and the natural and social sciences. An interdisciplinary culture knits all these disparate parts into an even more powerful force for change, says Daniel Rochberg, an instructor at Rollins and in the Department of Environmental Sciences and another founding member of Climate@Emory. "Emory is one of those rare places where people truly are interested and willing to collaborate across disciplines," he says. "That makes us especially well-positioned to make a difference in the area of climate change." Before joining Emory, Rochberg worked with the U.S. Department of State, serving as special assistant to lead U.S. climate negotiators under both the Bush and Obama Administrations. Developing partnerships and policies that guide and strengthen the response to climate change at Emory, in Georgia, and beyond. Producing high-impact research on climate science, climate impacts, strategies for reducing greenhouse gas emissions and approaches for increasing resilience to climate change. Boosting climate literacy across the Emory student population and beyond, to help train future leaders who are empowered to combat climate change and its impacts. A major milestone for Climate@Emory was gaining observer status to United Nations climate talks. Emory plans to send a delegation of faculty and students to the 2015 UN Climate Change Conference in November-December, to both present their own research and to gain knowledge and insights that they can bring back to Atlanta. The goal of the Paris conference is to reach a new global deal to try to avoid a dangerous increase in global temperatures. The university is going beyond research and community engagement to lead by example. In 2005, Emory pledged to reduce its energy usage per square foot by 25 percent in 10 years, a goal it met early, in 2014. The university is now pursuing targets of a 20 percent reduction in greenhouse gas emissions by 2020 and a 50 percent reduction by 2050. Environmental sciences lecturer Shaunna Donaher coordinates minors in sustainability science and earth and atmospheric sciences. Just begun this semester, the new minor in earth and atmospheric sciences (EASC) "allows Emory students to focus on a particular subset of environmental courses, many of which deal with the past, current and future climate of the Earth system," she says. Donaher is leading an effort through the Climate@Emory initiative to compile a database of Emory's 50-plus climate-related courses. This information will be organized by level, department and theme, including climate in the humanities, to make it easier for students to identify and take climate-related courses. "Once the database is complete, our goal is to compare our offerings to other universities to determine what we have here that makes Emory special, and if there are any gaps in our curriculum that we can fill with new courses," she says. "This is an initiative that began last year and is ongoing." Justin Burton, assistant professor of physics, is studying the physics of glaciers and ice in the polar regions of the Earth. "Right now we are currently investigating the calving process, where icebergs, some as large as all of downtown Atlanta, break off from the front of glaciers and fall into the ocean, often generating earthquakes," he says. "Understanding how to interpret the seismic signature of ice loss and calving can help us better monitor changes in global ice coverage, a sensitive indicator of climate change," Burton notes. A strong interest in applying physics knowledge to global problems has made climate change an important topic in his research and teaching in the last year. Stefanie Sarnat, associate professor of environmental health in Rollins, is working on two studies. Funded by the National Institute of Environmental Health Sciences, one study is assessing the impacts of climate change on the prevalence of heat-related disease among vulnerable populations in Atlanta, working with colleagues Andrea Winquist, Howard Chang at Rollins and Jeremy Hess in the School of Medicine and in collaboration with Andrew Grundstein at the University of Georgia. "My team is estimating how future climate change may affect local demand for emergency medical care in the Atlanta metropolitan region," Sarnat says. She is also conducting a study assessing the impacts of air pollution mixtures on the prevalence of acute cardio-respiratory disease in five U.S. cities, including the impact of temperature and climate on air pollution-health associations. This study is part of the Emory University/Georgia Institute of Technology Southeastern Center for Air Pollution and Epidemiology. Justin Remais, associate professor of environmental health and director of the graduate program in Global Environmental Health in the Rollins School of Public Health, is collaborating on a National Science Foundation study with Karen Levy, assistant professor of environmental health, to develop computational models for estimating the impact of climate change on water quality and waterborne disease in key tropical and subtropical areas. "We are devising strategies to moderate potential future risks, and developing new analytical tools to assess their impact," Remais says. With field sites in western China and northern Ecuador, the project brings together top earth scientists, environmental engineers, mathematical modelers, social scientists and epidemiologists from Emory, University of Florida, Georgia Institute of Technology, Trinity College and University of Michigan. In her other research, Levy says she's focused on "trying to actually get data to support the assertions that climate change will have the potential to affect water borne diseases… Everybody and every report, when they talk about climate and health, they always mention waterborne diseases. But having hard numbers to characterize the relationships is much harder to come by." Levy points out a major aspect of collaborative research on climate change: "I think one of the most important things that is often overlooked is collaborations with social scientists because behavioral change is the most difficult thing in public health." Maeve Howett, associate professor in the Nell Hodgson Woodruff School of Nursing, is a member of the U.S. Centers for Disease Control's Region 4 Pediatric Environmental Health Specialty Unit (PEHSU), a network of experts in children's environmental health. "More and more we're asked to answer questions about climate change," she notes. As a member of the Environmental Protection Agency's (EPA) Children's Health Protection Advisory Committee, she will go to Washington, D.C., in late April where the committee will write an advisory letter to EPA Director Gina McCarthy on climate change. Through PEHSU, Howett helps lead an annual program "Break the Cycle." "We mentor student projects on environmental topics and bring the students onto our campus to present their papers at the Environmental Health Conference to be held this year April 23-24 at the Pediatric Research Building," she says. The students' papers are also published. The very competitive program with only 12 slots attracts students from Chile, Colombia, Mexico and the United States. "We did some research and the past participants said very clearly that participating influenced them to go into careers where they are working on environmental issues," she adds. Working with smallholder farmers in West and East Africa, and more recently in the southeast United State frames Carla Roncoli's research on adaptation to climate change. "I seek to understand how they think about climate, how they perceive and predict climate changes, and how they use this knowledge in making decisions about what to plant, when, where and so on," says Roncoli, associate director for the Masters in Development Practice and a senior research scientist in the Department of Anthropology. She works at the community level, spending considerable time in the field to build rapport and to understand farmers' lived experience from their own point of view. "In the last 20 years climate science has made significant advances in its ability to predict climate anomalies, through improved observational and modeling capabilities," she says, citing for example, understanding the effect that the El Nino phenomenon has on climate worldwide. "Agencies that conduct and support this research, such as the National Oceanic and Atmospheric Administration and the World Meteorological Organization, are increasingly engaging social scientists to understand how this new information could be used to address global problems, such as rural poverty and food insecurity."